Notes: Sierran Guide and Fly Tier, Rick Fox, developed this pattern around 2006 and tested it in the waters of the Little Truckee. The pattern is very effective as a caddis pupa and has become one of the most successfull caddis pupa patterns in the West. 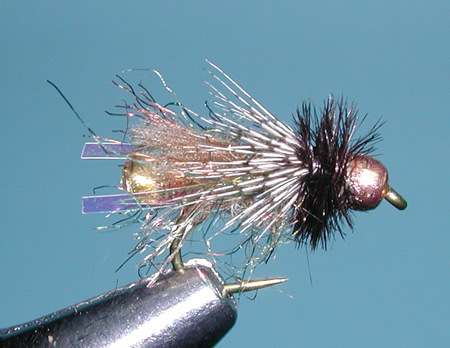 The fly is marketed by Umpqua Feather Merchants and can be found in most fly shops. The unique feature of this pattern is the encapsulated bead body that is tied as an extension. 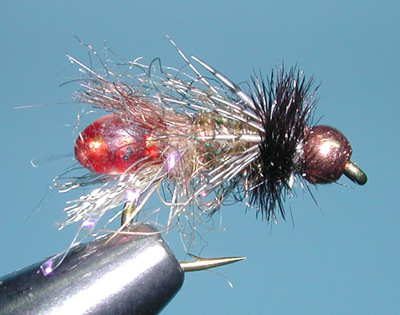 The epoxy covering gives the sheen of a caddis trapping gas molecules and rising through the water column. You can visually see the two gaseous areas of the pupa on Ralph Cutter's photo above. That is what this pattern mimics. The Z-lon material and CDC, used as an overbody, provides additional material to actually catch small air bubbles and add to the realistic nature of this pattern. The thorax is a mixture of Buggy Nymph dubbing and Ice Dubbing. When picked out, this provides a very "buggy" appearance with strands mixing into the CDC and Z-lon. The Ostrich collar provides that dark head from which the partridge legs emerge. This pattern has had a lot of thought behind it with a good use of materials. 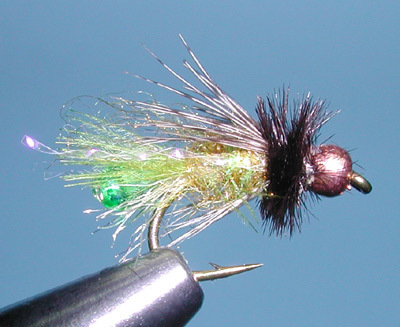 Try the Radical Caddis as a dead-drift through runs, riffles, and pocket water.